We are easily accessible from the main A4113 that passes through Knighton, and signed from the main road just east of the town. The Centre is about 8 minutes drive up Llanshay Lane. 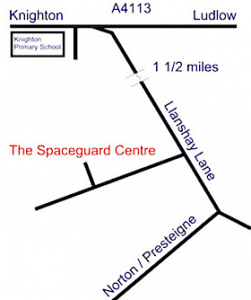 If you are using SatNav or online maps with our postcode, ignore them for the last couple of miles and stay on Llanshay Lane until you see signs for the Spaceguard Centre (about 1.5 miles). To open a local map in a separate window use this link. There is a regular train service to Knighton, but it is a long walk from the station! A taxi is a better solution. Zoom out on the map below to see where we are compared to local places. Evening (Pre-booked only. We do not run evening tours when we are on BST): Adults £8.00, Children (5-15 yrs) £5.00. A minimum charge of £48 will apply to evening tours and pre-booked groups. For details of school tours see our Education page. Conducted tours only, no unaccompanied access. Day or evening group tours can be booked for any time during the year. Daytime tours last for about an hour and a half, depending on how many questions are raised! Evening tours can last longer if the sky is clear. Numbers are limited, and we sometimes have large groups.